Start by cooking the meat balls according to the instructions on the pack (10 mins in the oven). While they're cooking make the sauce by softening the onions and garlic in a pan on a medium heat, then pop all the other ingredients in to a food processor (if you don't have you you can have it chunky) and leave to simmer and reduce. Remove the meatballs, chop in half and add to the sauce for a few minutes. 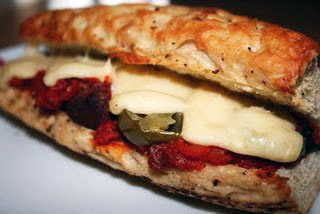 Slice the baguette length ways, put the sauce and meatballs in and top with the cheese and jalapenos. Pop in to the oven for 5 minutes so the cheese is lovely and melty, plate up and enjoy!